Oslo’s new city government has been speeding up measures to make the Norwegian capital more climate-friendly, but some of its efforts are backfiring with residents. Sudden and harsh new parking regulations, higher fees both for parking and driving, restrictions on driving diesel-fueled vehicles and a goal to make the entire downtown area free of cars within the next few years are now meeting opposition even from voters who supported the new city politicians’ campaign promises. The new regulations, and promises of more to come, are proving far less popular in practice than they were on paper. 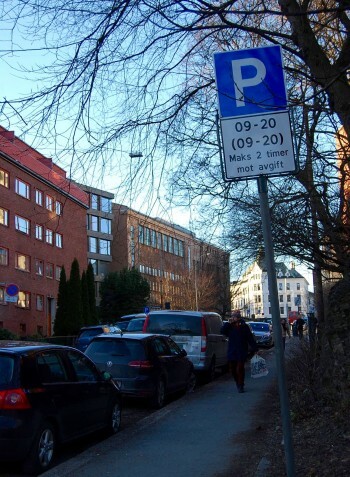 Thousands of Oslo residents want to put the brakes on the new parking rules especially, with calls are going out for city officials to quickly shift into reverse. New signs went up around Oslo shortly after New Year that caught many car owners by surprise. The period during which parking fees are charged was extended to 8pm on weekdays, instead of 5pm earlier, and to 5pm from 3pm on Saturdays. At the same time, cars are now only allowed to occupy a parking space for two hours during the new time span for regulation, meaning that their owners have to move their cars to a new space when their parking allowance expires, instead simply buying proof of allowance to park for another two hours. Moreover, the fees charged for the two-hour parking tickets were jacked up by 50 percent in the downtown area and 20 percent in the rest of the city. The combination of higher fees and more restrictions was aimed at discouraging driving into town and boosting circulation. For small business owners and residents of areas lacking special privileges for those living there, the new rules have become a nightmare. No longer can residents come home from work in the late afternoon and park their cars for the night, unless they return home after 8pm and are lucky enough to find a space on the street. Instead they also must pay for two hours and then run out and move their cars if time’s up before 8pm. That forces many to circle around their neighbourhoods, searching for a new space, leading them to claim they’re now actually driving more than ever before. The new rules “were not thoroughly thought through and it’s doubtful they will function in accordance with their intention,” editorialized newspaper Aftenposten just before the weekend after days of reports on angry car owners who are on a collision course with city officials. Several stated they felt car owners were being bullied: “It seems like everyone who drives a car is being stamped or treated like an environmental pig, and now has to put up with all this,” claimed Herman Gjeitanger, chairman of a residents’ association in an apartment building on Kirkeveien, a busy thoroughfare on Oslo’s west side. Few if any garages exist in the area where many residences were built before cars were invented, while parking on side-streets has become all but impossible. Tempers rose higher last week when state meteorologists forecast a light snowfall in the Oslo area for the following evening. Within minutes, city crews were sent out to post signs warning no parking at all on many city streets just 24 hours later. That was because city officials also have been setting up new bike lanes around the city, some of them just outside the few street parking areas that remain, and the city officials don’t want car owners dragging snow into the bike lanes when they drive out. The officials also figured that banning cars altogether would greatly speed snow removal if enough snow fell that plows were called out. All told, around 250 street parking places disappeared almost overnight, and the new parking regulations come on top of measures to restrict use of diesel vehicles and both add and raise tolls for driving into the city. While many hail plans to promote bicycling over driving, reduce air pollution and relieve traffic congestion, complaints are running high that the measures making driving even more difficult and expensive than it always has been in Norway are coming before alternatives are available car owners. Few if any new garages or central parking lots have been established, for example, and the regulations were imposed with little warning. “They (city officials) have been imposing measures without realizing the consequences,” said one local resident, Christian Rom. “What does the city think we should do with our cars?” asked another, Ingrida Balseviciute. “We can’t just become a cycling city overnight,” claimed yet another, Hege Mentzoni Jankowsky. Still others have claimed the new regulations were imposed in a highly “undemocratic” manner. So vehement have the protests become that Norway’s National Automobile Federation (NAF) suggested city officials “need to have a little chat in the backroom,” admit they’ve “careened a bit too fast around the curves” and reverse some of their new rules. “This can be seen as simply plaguing car owners,” Elisabeth Sagedal of NAF told Aftenposten. It’s not smart for a new city government, she suggested, to immediately be viewed as being out of step with the people it serves. The new government, which put the Labour Party into power with the help of the pro-environment Greens and Socialist Left parties, had in its defense a mandate from voters to make Oslo “greener.” The Greens Party did especially well at the polls, and had run on a campaign of imposing precisely the anti-emissions measures that are now rolling out. City bureaucrats charged with putting the measures into practice are stuck in the middle, and stress that many of the measures are “trial projects” or “preliminary measures” to see how they’ll work. It remains unclear whether the new city politicians will listen to people like Kverneland. “In the years ahead, there will be less street parking because we’re putting a priority on cycling,” Lan Marie Nguyen Berg of the Greens Party, who’s now a member of city government, told Aftenposten. She said she understands that it can be difficult to get used to the new parking rules, but claims she and her colleagues must make improvements for pedestrians, cyclists and in public transport instead. “I’m sure we’ll together find good solutions for those who live or run businesses in the city center,” she said. She’s already facing a lack of police enthusiasm to enforce restrictions on driving diesel vehicles when they’re imposed but had good response to a recent offer from the city to subsidize the purchase of electric bicyles. The NOK 5 million in funding ran out within three weeks, because the measure was popular.